A cast-iron skillet cookie stuffed with chocolate hazelnut spread and sprinkled with flaky sea salt. Golden brown on the edges, but gooey in the center, this giant chocolate chip cookie is the perfect dessert for a crowd. Serve it warm with a big scoop of vanilla ice cream! When I was in college, a friend introduced me to baking cookie skillets. Because we were college students, once the skillet came out of the oven, we just topped it with a few scoops of ice cream and passed around the spoons before digging right in – no plates necessary! I fell in love immediately with the simplicity of the recipe, as well as the decadence of eating a giant, warm, gooey chocolate chip cookie straight out of the oven. Nowadays, I give everyone their own plates, but this Nutella stuffed cast-iron skillet cookie is still one of my favorite desserts to make when we are hosting a small crowd at our place. And most especially if sports are involved! Ben grew up in Kansas City and is a loyal fan of the Chiefs, Royals, and Sporting KC. But he also enjoys watching sports in general, and it’s not uncommon for him to invite a bunch of people over for an exciting game, even if his team isn’t playing. On the other hand, I rarely (if ever) watched sports growing up and while I’ve developed some interest and adopted Ben’s Kansas City sporting teams (oh, the crazy things we’ll do for love), I still find it really hard to sit still and watch a three-hour long game. So, I usually end up taking it upon myself to put together the game day menu, which helps keep me occupied. Cookie skillets usually make it on my list since they are best served basically right out of the oven (i.e. they aren’t ideal for taking to an event outside my home) and the dough can easily be made ahead. Plus, it’s a huge crowd-pleaser every time!! 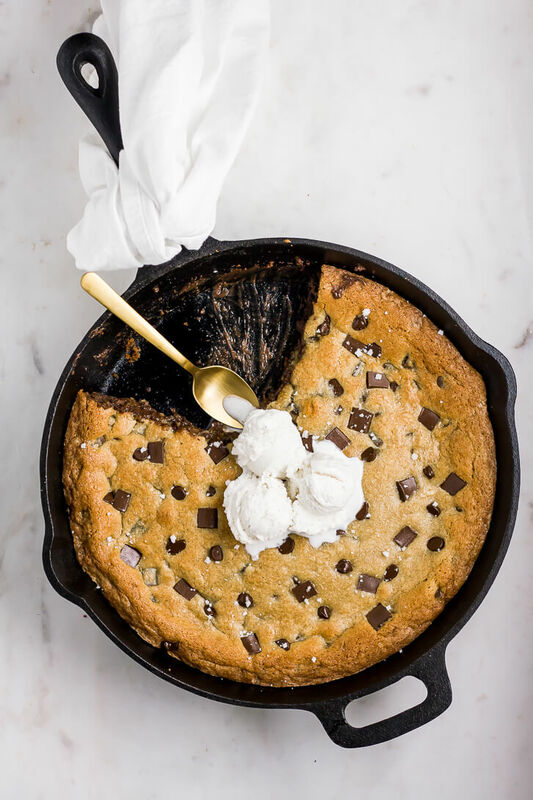 This skillet cookie recipe starts with just a basic chocolate chunk/chocolate chip cookie dough. I use both because I like the variety, but you could stick with just one or the other if you’d like. If you are pre-making the dough, just cover it before either refrigerating for up to 3 days or freezing for up to 3 months (talk about planning ahead). Before baking, I press a few extra chocolate chunks/chips into the top of the cookie dough (for looks). And once the skillet comes out of the oven, I immediately sprinkle it with some flaky sea salt because chocolate chip cookies with sea salt are the best! In terms of equipment, I use a 12-inch cast iron skillet , but if you have a smaller skillet, you’ll just want to adjust the amount of cookie dough and/or the baking times as necessary. Regardless, I usually start checking on my cookie around the 15-20 minute mark so I can pull it out at just the right moment. For me, that moment comes at right about 25 minutes, but depending on your oven and your preferences, it could take more or less time. To know when the skillet cookie is done, I look for a golden brown color, with the center being just barely set on top, so it’s still a little under-baked beneath the surface. Remember that the cookie will continue to set once you remove it from the oven. I let my skillet cool for about 15 minutes before slicing it up and topping it with scoops of vanilla bean ice cream. Serve immediately! A cast-iron skillet cookie stuffed with chocolate hazelnut spread and sprinkled with flaky sea salt. Golden brown on the edges, but gooey in the center, this giant chocolate chip cookie is the perfect dessert for a crowd. Best served warm with a big scoop of vanilla bean ice cream! Preheat the oven to 350 degrees Fahrenheit and generously butter a 12-inch cast iron skillet. Whisk together the flour, salt, and baking soda until incorporated. Set aside. Using an electric mixer, cream together the softened butter and sugars until light and fluffy. Add eggs & vanilla, then beat to incorporate. With the mixer on low, gradually add the dry ingredients, mixing until combined. Fold in the chocolate chips and chocolate chunks with a wooden spoon or spatula. Divide the cookie dough in half, and spread one half of the cookie dough across the bottom of the cast iron skillet, pressing it with your fingers to the edges. Spoon Nutella on top of the bottom layer of cookie dough in dollops and spread evenly with an offset spatula (or the back of a spoon), leaving about a 1/2 inch of space around the edges. Cover with the remaining half of the cookie dough. I find the best method is to scoop out balls of dough and use your hands to flatten them out and place them on top of the Nutella. Use your hands or an offset spatula to spread it out as necessary and to seal the edges until you have an even layer of dough on top. Bake at 350 degrees Fahrenheit for 20-30 minutes (depending on how done you like the center to be - mine was perfect at 25 minutes). The top of the cookie should be golden brown and set in the middle, but slightly underdone underneath. If you want to bake the cookie longer and the top is browning too quickly, cover it with foil. Remove from the oven and sprinkle with sea salt immediately. Let cool for about 15 minutes, then slice and serve with a scoop of ice cream on top.